Why not just restore NJT Rail service from Camden to Millville with one of the stops being along Glassboro??? I actually like PATCO, but my problem with the system is that they only have one line, and it's the only major heavy rail line in much of South Jersey (another one is the Atlantic City line). I'd rather see PATCO go to Cherry Hill, Maple Shade or Moorestown, Deptford, and Woodbury rather than go so far to Glassboro, and let NJT provide long distance travel to Jersey Shore destinations such as Ocean City, Wildwood, Care May, Long Beach Island, and other points such as Millville, Salem, Bridgeton, and Pennsville. A light rail extension by PATCO is too costly because you need to build separate tracks for the light rail, separate light rail stations in Center City Camden as opposed to the current ones such as City Hall and Broadway, and while much of the light rail will use the former PRRSL ROW to Glassboro, you have to retrofit it for use as a light rail system, meaning that the conversion is too costly!!! I'd rather see NJT use those tracks than PATCO!!! A big example is the current River Line from Camden to Trenton. While the River Line is currently a viable rail route, the total cost as well as the cost overruns were so expensive, while restoring as a heavy rail route would've been much cheaper. The fact that the River Line runs at grade in downtown Camden is another reason why I'd rather have heavy rail with a rail station terminal at the WRTC on Broadway. It's just too risky to having so many potential light rail train/auto accidents happening such as the accident in Downtown Newark involving both a light rail train and an automobile. It would've be much more smarter and much less costly to just build a multimodal terminal on Broadway for city buses, coaches, and trains, than the current WRTC, which is dirty and very outdated as a transit hub, and allow NJT to provide long distance rail service and PATCO for short distance subway service. If PATH in the NYC area is extending it's system to Newark Airport, then why can't PATCO extend it's system??? 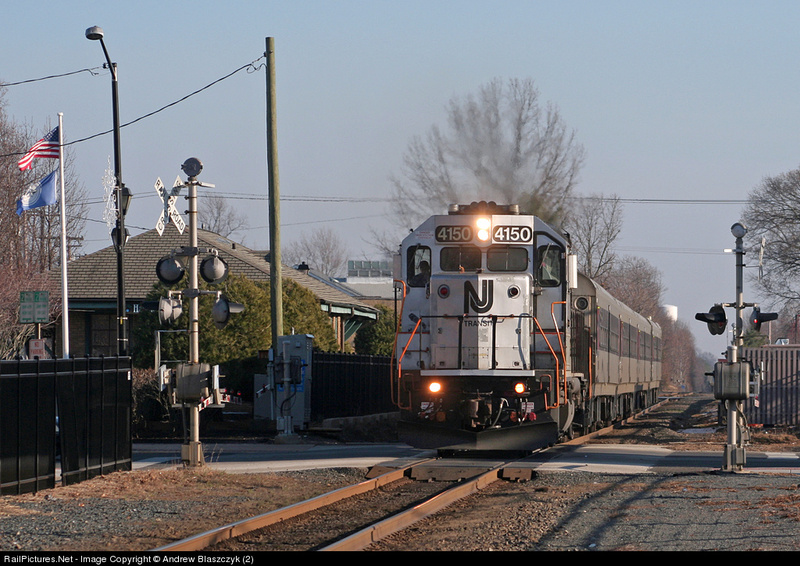 wanderer34 wrote: Why not just restore NJT Rail service from Camden to Millville with one of the stops being along Glassboro??? wanderer34, did you read the OP-ED piece linked from the original post? Bill Vigrass points out that the fundamental problem with Light Rail as the Locally Preferred Alternative is the lack of direct access to Center City Philadelphia. The presumably lower frequency of Commuter Rail service is even less attractive than Light Rail given this limitation. A light rail extension by PATCO is too costly because you need to build separate tracks for the light rail, separate light rail stations in Center City Camden as opposed to the current ones such as City Hall and Broadway, and while much of the light rail will use the former PRRSL ROW to Glassboro, you have to retrofit it for use as a light rail system, meaning that the conversion is too costly!!! I'd rather see NJT use those tracks than PATCO!!! A big example is the current River Line from Camden to Trenton. While the River Line is currently a viable rail route, the total cost as well as the cost overruns were so expensive, while restoring as a heavy rail route would've been much cheaper. Think about why the Camden-Millville service failed. PRSl was running a shoddy service which, at the end, required a bus connection even to get to downtown Camden. The point to be made is that the service was unattractive, and no one wanted to use it. Light Rail, while more expensive, at least would offer greater frequency of service. Both options are undone by the lack of frequent service provided by PATCO - and nothing about building Light Rail or Commuter Rail resolves that issue. Frankly. especially for discretionary travel on the weekend, I wouldn't be willing to wait more than five minutes to transfer between modes. I would rather drive. If you factor in a destination that is beyond Center City, it becomes very problematic due to service frequencies. The fact that the River Line runs at grade in downtown Camden is another reason why I'd rather have heavy rail with a rail station terminal at the WRTC on Broadway. It's just too risky to having so many potential light rail train/auto accidents happening such as the accident in Downtown Newark involving both a light rail train and an automobile. WRTC isn't Hoboken, and South Jersey/Philadelphia is not North Jersey/New York City. The transit dynamics are different. Cross river tolls are $5.00 (with frequent user discounts) not $15.00. The level of road congestion isn't the same, and therefore the transit options need to be far more attractive (i.e. a one-seat ride) than is required for North Jersey. And even there, organizations Like the Raritan Valley Coalition are working to the required eliminate cross-river transfers into New York City. I would embrace Commuter Rail - if it included a new tunnel between Atlantic Avenue (South Camden) and Suburban Station. But who is going to pay for that? Why couldn't NJT just go to 30th upper level and terminate at Suburban via Girard/Zoo? Political and Interagency beaurocracy aside, I'd rather end up at Suburban than 8th and Market or 15th and Locust. Also very cheap to accomplish with dual-modes and excess stub-end capacity at Suburban. When the PATCO plans first started to circulate through the communities 10 years ago I went to the town meetings - Absolutely zero serious engineering studies had been done, the public was presented with pie in the sky dreams of running via Route 42, the Atlantic City Expressway, and Route 55 from Camden to it's terminal points, which were described as being a better alternative to using the existing former PRSL/WJ&SS routes. I have an engineering background and when I pressed the presenters with serious right-of-way planning questions I was told that they had "Not yet been undertaken." The big problem with the proposal is no one wants to fund or operate the system. NJT is still criticized for the generally low ridership numbers on the River Line, ridership on the Atlantic City Line is declining, so NJT sees the project as a money loser set for failure, especially when they want to spend money for rail on north Jersey service improvements and expansion. PATCO is a nice thought, and once the PRR ran third rail service via Woodbury, Glassboro, and Millville so the right of way is there for third rail service. The key problem: How does PATCO connect their existing system to the route to Millville? Dig an extensive network of subway tunnels via Camden? Change trains at Camden? Double back via the Atlantic City line via Haddonfield or Lindenwold? Tunnel options are very expensive and would likely see local and state opposition. PATCO faces another challenge which is that they are independent of the two other commuter carriers, NJT and SEPTA, so there would be the need for passenger transfers between services, which can turn the commuter rider off. PATCO's plan is full of engineering and planning obstacles that will not easily be overcome. My opinion: Light Rail Service by NJT. I think 30th Street Station should be the terminal, and then run via Camden to Woodbury to Glassboro and/or Millville terminus. That route provides the greatest number of logical station stops, the best terminal points, and the simplest number of connections required by the commuter. Use of railroad rights-of-way makes the most sense, because of economics and the way it would fit in with contemporary ideas of transit-oriented development, but how would light rail get to 30th St.? The ACL and freight rail lines access Philly from south Jersey using the Delair Bridge over the Delaware north of Camden in Pennsauken. A new light rail operation would have to cross there as well - the connections to make that happen already exist. That would require temporal separation from freight trains to and from Pavonia, Amtrak Acelas and Regionals all day long, SEPTA locals every hour or so, and the ACL. Deutsche Bahn does just about that, without temporal separation, on the Karlsruhe-Basel main line (for several years now, without collisions as far as I know), but this isn't Germany. I don't know how you could get LRVs into 30th St. over existing trackage, and 30th St. has high-level platforms. delair bridge is on live support. Make repairs nessesary to support freight activity and funnel all passenger rail into Camden the way it was before. A commuter rail tunnel Camden/center city imho is the only real option here. We are congested and it is only getting worse. Philly is replacing parking lots with buildings with the quickness and Camden will be following suite on the riverfront shortly. We need to start looking at delair alternatives now. If you brought the AC line through Camden and the tunnel you are talking about a massive improvement in the timetable which will improve ridership. The roundabout route which is slow and plagued with unexpected delays for bridge openings and nec clearance is not attractive at all to riders. A pipedream of mine would be for PATCO to use some of the CC loop to go up to Logan Square, and then down the Parkway to the Art Museum. Unfortunately, it will only ever be a pipedream. Wasn't that the plan Rizzo entertained along with the Center City Commuter Connection? Really? I've never heard of that. Do tell. Apparently one possible option is to convert the ROW into a dedicated busway with CNG vehicles. Dcell wrote: Apparently one possible option is to convert the ROW into a dedicated busway with CNG vehicles. That's an active railroad so I'm pretty sure that's a non starter.